The Super7R has been the wood floor edger of choice for the professional contractor for over 50 years. This machine is known worldwide for its unmatched power, versatility and ease of operation. 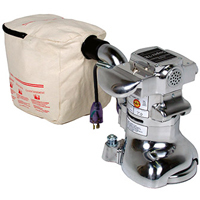 The Super7R features a quick release dust bag and attaches directly to a vacuum for efficient dust containment.